Is there a universally accepted definition of stress? ... Sadly, the answer is no - at least not a clear one. Distress, which is commonly known as the condition or state of stress, is the counterproductive overdose of the productive stress. Your body is no longer able to maintain the high levels of pressure caused by the release of neurochemicals and hormones and your performance falls! Now, was that not a definition of stress right there you ask? ... Well yes and no. For a real discussion on the matter, you can read The Stress of Life by Hans Selye. The problem is that even though it sounds simple enough, it really isn't. We can measure the body's levels of cortisol and stress hormones, the blood pressure and heart rate and so one, but there is really no way of knowing when the counterproductive processes starts setting in. Typically, people recognize the stress and realize that they are stressed way too late! Remember: It is when you realize that you don't have to be stressed, that you are really able to make progress and relieve stress! Stress is a natural state. You experience it to some degree every day. Learn to work with it. Do not fear it! An excellent way to illustrate what I described above is with The Human Function Curve adapted from Nixon. The curve above is widely known and very informative. Though every person is an individual it shows the basics when we talk about healthy stress and non-healthy stress (distress). 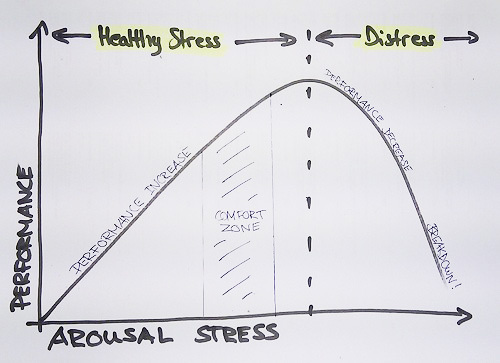 The defining character is the turning point at the very top: Until a certain point you will increase you performance when stress is increasing, but only to that certain point. At the top fatigue sets in and performance is then rapidly reducing. If you are being exposed to ever more stress, chances are that you will reach a point of breakdown. A Real Definition of Stress? In medical science terms the definition first put forth by Hans Selye, is the most recognized. He is known as "the father of stress" and was in many ways way ahead of his time when it comes to the science of stress. "any event which may make demands upon the organism, and set in motion a non-specific bodily response which leads to a variety of temporary or permanent physiological or structural changes"
As you can see, that definition is very general. However, I don't think it is a good idea to try and contradict a 10-time Nobel Prize Nominee with 39 books and a mountain of articles on the subject! If you want to learn more deeply about his work and views on stress, I would recommend grapping a copy of his book The Stress of Life. It is written to a broad audience and even though you may not get every phrase (I know I didn't the first time) I think anybody can gain from reading the book! More on H. Selye and the definition of stress. More Categories and Stress Scales? Some times more categories and scales are used to look at stress and levels of stress. Usually you will get a list of questions, where your answers are given a value. These values are then compiled to a stress score, the number is an indication of your measure of stressfulness. This is also known as a stress test. While these tests can be very informative - always see it as a guideline! If you think you are feeling stress, or showing any signs of it, please consult a physician. ... but what if that 10 is from one category only? It might be a full-blown migraine. Then that is your stress sign, and that is what you should act upon. You may not ever get any of the other symptoms. That does not mean that you are immune to stress! Stress is an individual thing. Nobody is the same. We don't all fit in the same boxes. That is why, you should not put too much into any, very specific definition of stress.